JUNE UPDATE: New central AC was just installed ! Incredibly quiet !! Individual room climate control. Aloha! We are excited to share our condo with you for your beautiful trip to Maui and we would like to make your vacation as enjoyable as possible. The unit is supplied with all of the things we had hoped to find in a vacation rental, including lots of spices, new cookware and dishes and even zip lock baggies, tin foil and Q tips (to get the sand out of your ears !!). The goal is to save our guests some expense and eliminate the need for packing such items in your travel luggage. Our newly purchased and completely remodeled unit in sunny South Kihei is in the heart of the beach town within walking distance to world class beaches, restaurants, bars, and shops. There are many days you may find that a car is not necessary. The Island Surf Building has a delis, dive shop, bike rentals, day spas, surf shop, and other convenient businesses located on the first floor. It is across the street from Kalama Beach Park where one can either watch or participate in basketball, roller blading, skate boarding, sand volleyball, snorkeling, surfing, paddle boarding, and fishing. "The Cove", located just across the street, is well known to be the best beginner surf and/or paddle boarding area on the island. Rental gear and/or excellent instructors are conveniently located at the new Maui Wave Rider surf store across the street. One can easily enjoy watching your friends and family play in the ocean or at the park from the private lanai. Whale season is between November and April, and the whales are easy to spot from this unique, top floor lookout. There are no power lines, poles, or other buildings obstructing your view. Our top floor condo is bright and provides direct, unobstructed Pacific Ocean views and sunsets every evening via the floor to ceiling glass wall in the living room/kitchen. From the lanai you can see the Islands of Lanai, Kaho'olawe, and Molokini crater. New double pane glass throughout the unit provides silence when you want it, and the huge sliding glass door to the 16 foot Lanai brings the outside in when you choose. Our unit is one of only four top floor vacation rental units facing west that allows viewing the incredible westerly sunsets regardless of the time of year you visit!! You are also in a great location for day trips to Haleakala, Hana, Lahaina /Kaanapali, and Wailea. The airport is conveniently located within 30 minutes of The Island Surf and thus "coming and going" is both quick and easy. * Ceiling fans in Living area and Bedroom with remote controls. * Bathroom complete with Granite Counter Top, new Tile throughout, including a waterfall faucet that reminded us of the Four Waterfall Hike on the drive to Hana!!! *Two new large LED flat screen TVs with DVD/Blue Ray players; Digital TV cable.Two AM/FM radios-I Pod compatible. * Beach Toys inlcuded ( Snorkel Sets, Boogie Boards, Beach Chairs, Thick Beach Towels, Two Coolers, and........... a "Mr.Wilson" Beach Volleyball for possible use in either of the two sand volleyball courts across the street in Kalama Park. * Fantastic and Caring Guest Service. Our On-Island contact is within walking distance to the condo, and will promptly attend to any issues you may encounter. We enjoy a close friendship with the owners of the adjoining unit who also own a unit on the 4th floor, thus we can possibly jointly offer wedding party/family reunion/special occasion accommodations with sleeping accommodations for up to 12 people. This condo has only been listed on the vacation rental market for two plus years and we are excited to receive your reviews!!! So far they have been incredible. It is legally licensed for a vacation rental, Hawaiian Tax ID 011-116-5440-01. In regard to the official tax ID number, regardless of where you stay, make sure your condo owner provides you their number to you before you book. Condo owners that do not provide their tax number are often not licensed and are probably operating illegally. Please be careful, the state of Hawaii has recently emphasized enforcing this and you may find yourself without a place to stay when you arrive. IE Kauai recently closed 320 non-permitted vacation rentals with only two weeks notice and guests were left without accommodations. Whether you stay at Island Surf or elsewhere on Maui, please do some research and check this out before making reservations. The top floor at Island Surf offers some spectacular and unobstructed views and the central location is within easy walking distance to local beaches and with the ability to walk to so many attractions. It is complete and spotless with all new tile, appliances, electronics, and furniture for you to enjoy. UPDATE: June 2016, expensive new central air conditioning system installed. No more noisy window AC !! During our recent 2015 remodel we were surprised to hear comments from many of the local residents on Maui regarding this incredible and unique view from the top floor @ Island Surf. Spotless, Granite Counter, Waterfall Faucet, All New Tile, Tub/Shower; New High Quality Thick Towels. New, June 2016 ! Expensive Split AC system allowing individual bedroom and main room climate control. INCREDIBLY QUIET. New, Superior Linens provided for Bedroom, Bathroom, Kitchen, Beach. 2 Elevators access the 6th floor. Elevator access is close by and stairway is also close by. Bright, Ceiling to Floor Direct Ocean View. Water/Ice dispenser in door. Large Freezer. New Self Cleaning Glass Stove Top. Spices and coffee filters provided. Including Quality Pots and Pans, BBQ Tools. Granite Kitchen/Bar Counters, all New Stainless Appliances. Odds and ends: Blender, Coffee Pot, Hot Pot, Rice Cooker, Toaster, Coffee grinder, and numerous spices. Kitchen Granite Bar with four stools; Round Dining Table with four chairs; Lanai with 2 Tables, 4 chairs. 2 New Sony LED Televisions, with Blue Ray DVD Players. Cribbage, Quirkle, Rummikub, Chess, Checkers, Scrabble, Playing cards, Pinochle Cards. Snorkeling gear provided. Boogie boards provided. Excellent scuba dive shop downstairs and a new paddle board/surf board rental shop across the street Instructors as well. No steps from parking lot to the 6th floor Condo Unit. Immaculate Pool/Patio located on the second floor. Keyed entry, available only to Island Surf residents or guests. STEVE thought of everything. Well supplied from dish soap to coffee it was all there. The property was clean, accommodating and beautiful. Nothing bad to say. We simply had a great time. I loved having my coffee on the lenai in the morning and watching the surfers. We really loved this condo! The location was just right for us; it is well-stocked and comfortable, and the location is great. Kihei is our favorite place to stay on Maui, affordable and a good home base for any day trips and activities you might want to do. In addition, this complex is right across the street from a popular beach park, and that top floor ocean view is so beautiful. The lanai was the perfect place to start and end our days, watching Kihei wake up over morning coffee or waiting for another gorgeous Maui sunset over a glass of wine. We enjoyed being in walking distance to “the triangle” of shops, restaurants, and bars just a block away, and a quick drive to many others. The condo itself is stocked with everything we needed, from kitchen ware to shampoo, beach chairs and boogie boards. We really felt like it was our home away from home, and would love to stay here again! We absolutely loved the view from our private lanai. The location is very convenient with easy walk to many restaurants, and shops. 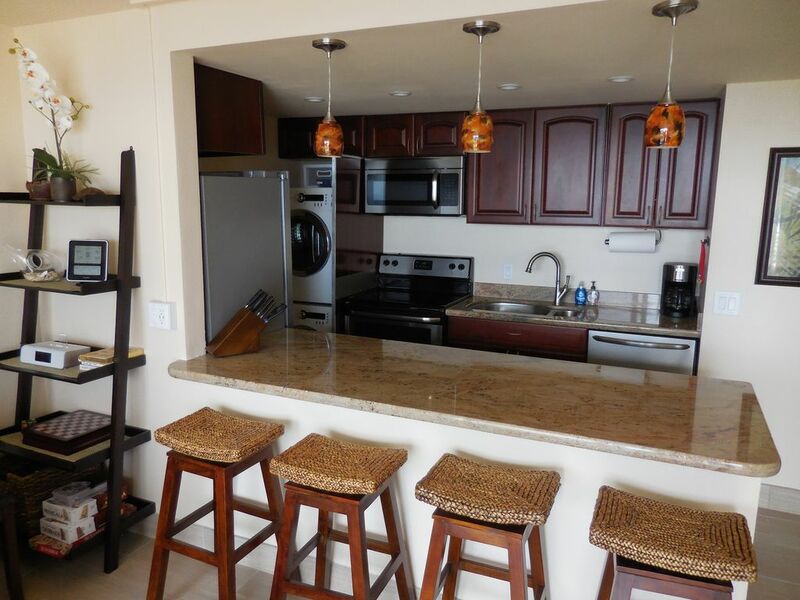 The condo has a fully equipped kitchen and everything you could want for the beach. And the best part is the comfortable bed after a fun day at the beach. We will definitely be going back again. Thank you Scott. We are glad you had such a wonderful time and appreciate you sharing your thoughts and observations with others. You would not believe the number of guests that have asked "where did we get it", "how much did it cost", and finally "we are going shopping for a new mattress when we get home".! Nice condo, clean and well equipped but does need at least 1 comfortable living room chair as sofa is the only seating. Everything good quality and appears fairly new. Wonderful ocean view. Good walkable location. Great place to stay Owners very accommodating. I agreee with Jim. A separate comfortable chair would be ideal, as it is at home , but I cannot figure out where to put one in the space provided in our condo. In addition to the very nice sofa, we have four bar stools, four very nice chairs chairs surrounding the glass table top dining table, and four cushioned chairs for the outdoor lanai. We have now returned home from a wonderful week in Maui. We loved your place. The location is terrific - we already miss sitting out on the lanai. We enjoyed having restaurants and grocery stores so nearby. Your place is very well stocked you have thought of everything. It was a pleasure dealing with you as you were very helpful and quick to respond. You had a lot of great suggestions. We hope to return to Maui soon and will hopefully be able to book your place again. Thanks so much Kevin and Irene. We are glad you had such a wonderful time and enjoyed the condo and location.!! We will be there in May and plan to replace any worn items (if any) and make sure it is "fresh and new" for arriving guests. Have a safe and enjoyable Spring and Summer. The view from the balcony is amazing. Super comfy condo with about everything you could need. Steve and Vicki keep this place well stocked with all the beach gear you could need. Great location, easy beach and highway access. Very quiet condo. Wonderful breeze with door/windows open. Great location within the building. The bed is so comfortable. We slept nearly 12 hours three different nights we were here. Best rest I’ve ever had on a vacation. You won’t go wrong choosing this condo. Thanks Steve and Vicki for making this such a wonderful trip for us. Thank you Saundra. It was fun communicating with you from time to time during your stay and learn about some of your activities and experiences. Happy to hear all went well and you were able to create some wonderful memories. There is a $100 non-refundable booking fee. If you cancel the reservation more than 60 days prior to arrival, you will be refunded 100% of your payment, less the booking fee. If cancelled less than 60 days prior to your arrival date, we will refund you if we can re-rent the condo to another guest. Our intent is to rent the unit for the days specified and not "double up" on the amount being paid. We will diligently attempt to re-rent the condo and refund your money. CANCELLATION POLICY: 100% refund if cancelled at least 60 days before the arrival date, minus the booking fee of $100. Service Fee (a separate fee charged via VRBO/Homeaway) is fully refunded on cancellations that qualify for the 100% refund.